As the new Glogo will be delivered in a few days we have relased the required update for VBar Control and VBar Control touch. Keep note that the Glogo requires a VBar NEO with Pro or Pro Rescue as well as a external RPM Sensor must be mandatory installed for VBar Governor. For Support - visit the Glogo section in our forum. Together with the latest (v58) Tribunus Firmware we have now the possibility to adjust a Capacity parameter (+-10%) in the ESC for better results. The regarding entry can be found in a VBar Control at ESC Settings / General. Using a VBar Control touch it is located in Protection and Limits of the Scorpion App. Additionally you can now turn of the powerup sound and also set some adaption to max RPM values in the Scorpion Governor. We also added the Scorpion error Codes and the initial decetion to the VBar Control / Model log (VBar Control touch has it already). Sensorhub App which allows using a VLink or non-Vlink NEO as Sensorhub with a special Firmware (VBasic is okay here). This will allow varoius inputs like dedicated switches, counters or analog signals. It also allows a output on the hub to drive a transistor etc. for own circuits. 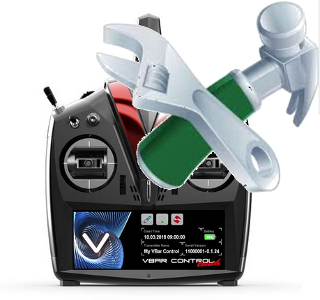 Have a look at the description for the VBC here to get an Idea how to use it. Fuelmeter App for measuring fuel consumption of turbine driven models - currently with a Flow Rate sensor connected to the Sensorhub named above.